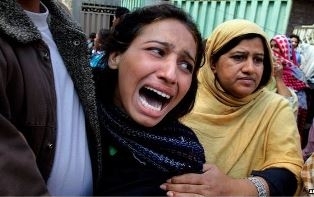 LAHORE, PAKISTAN (ANS – May 24, 2015) — A violent mob attacked Christians living in “Dhup Sarri,” located in the Sanda area of the Pakistani city of Lahore on Sunday evening (May 24, 2015) and ransacked churches, opened fire and attacked the locals, after a “mentally unstable man” had been charged with blasphemy. This last violence was revealed to us by ANS correspondent, Xavier Patras William, a journalist and writer based in Pakistan, in an urgent message to the ASSIST News Service (www.assistnews.net). The mob violence erupted, he said, began when Hamyun, who the minister claimed to be “mentally unstable and a drug addict” was burning a newspaper that had holy verses in it, and some Muslims “on the spot caught him” doing it and then spread the news and a mob then took him to the Gulshan e Ravi police station for a First Information Report (FIR) to be taken from the man. Between 5 and 6 pm, a violent mob attacked the area, opened fire, ransacked the churches, burnt houses and threatened the residents. St. Joseph Church was also vandalized. Reports says that members of the local Deputy Inspector General of Police’s team were injured by the mob, and the Dhup Sarri Catholic Church was also attacked by the mob, who rampaged through the Church, burning religious literature. The police used tear gas against the mob, some police officials were also injured but the mob, no police official was present to talk about the incident, the Rangers have been deployed to control the situation in the area. “Many people are fleeing the area fearing for their lives,” added Qasim Masih. Father John Arshad from the Dhup Sarri Catholic Church told our correspondent, “After the Sunday Mass, I was on my regular visit to the community, when I received the news that a ‘Christian man’ has been attacked by a mob and taken to the police station. “I went to the area to inquire with friends, Rizwan Paul and Malik Jahangir, and learned from them that the mob was now attacking the area. By the time arrived at my church, they had not yet vandalized it, but once I got there, I saw they were throwing away everything they could get their hands on and I also heard the gun shots. 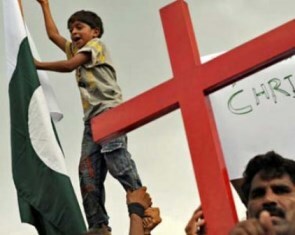 He was referring to an attack on Sunday March 15, 2015, when least 17 people were killed and more than 82 injured when two Taliban suicide bombers attacked churches in in Lahore’s Youhanabad neighborhood, home to more than 100,000 Christians. In the church attacks, a man rigged with explosives blew himself up outside the main gate of St. John’s Catholic Church after being prevented from entering by a security guard. A second blast went off minutes later in the compound of the Protestant Christ Church, about a half-mile away. 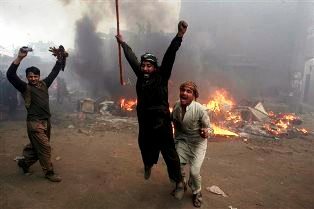 Photo captions: 1) Pakistani men celebrates another attack on a Christian community. 2) Young Pakistan protests against the blasphemy laws. 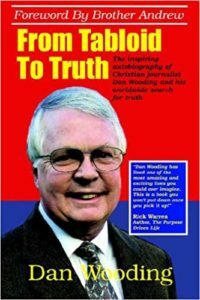 3) Dan Wooding with his award from the British Pakistani Christian Association..
About the writer: Dan Wooding, 74, is an award-winning journalist who was born in Nigeria of British missionary parents, now living in Southern California with his wife Norma, to whom he has been married for nearly 52 years. They have two sons, Andrew and Peter, and six grandchildren who all live in the UK. He is the founder and international director of ASSIST (Aid to Special Saints in Strategic Times) and the ASSIST News Service (ANS) and he hosts the weekly “Front Page Radio” show on the KWVE Radio Network in Southern California and which is also carried throughout the United States and around the world, and also “His Channel Live,” a TV show beamed to 192 countries. Dan has been given an award by the British Pakistani Christian Association for his reporting on Pakistan.